Still much the same as it was just over 4 years ago when I last visited (except it is now owned by Black Country Ales). I also think some external signage has been removed to reveal the original Holder's Brewery glazed tiles. BCA's Fireside, Pig on the Wall, BFG and Plum Pig were on sale last night (the last one being very good) as well as Grafton's Peanutter, Titanic's Chocolate & Vanilla Stout and Downton's Elderquad. Craft offerings were 3 from Salopian at well over £5 a pint. Whilst a pint of Plum Pig was a reasonable £3.40, a bottle of Hogan's Dry was £5.20 which seemed excessive (we should have ordered the draught Gwynt y Ddraig Black Dragon but opted for a more local cider). Easy to find a seat even on a Saturday night. An unexpected gem. We were heading to the Keg and Grill and decided to pop in for a quick pint. As others have said, extensive and well-kept selection of beer. Not mega busy due to its location even on a Saturday evening. Nice old fashioned decor and plenty of really well kept real ales (11 I think) and ciders. Landlord obviously knows a great deal about beer - so do the regulars. One minor gripe: for an unfashionable site away from the city centre the prices could be cheaper. Welcome addition to Birmingham's proper beer scene. Handy for New Street yet not as manic as the other options. I'd recommended this pub to a few other people and they liked it. So a return visit was planned for Tuesday afternoon this week. 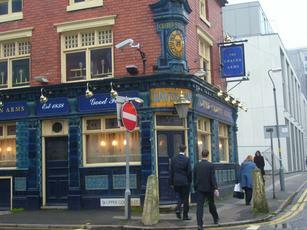 The place is clearly now a haunt for real ale enthusiasts, albeit not the easiest to find. Whilst it's a Black Country Ales pub, it appears to focus on specific breweries. On Tuesday, it was Cloudwater - Session IPA, Vermont ESB, US Light Ale, Black IPA, Pale & Smoked Porter. Black Country beers were Pig on the Wall, BFG & Fireside. Other guests were Pig & Porter Skylarking & Wishbone Rascal. Cider was Hogans Admiral Hopped, whilst the perry was Poachers Perry also from Hogans. One of Birmingham's better pubs.